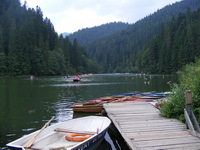 Romania is not a high-rated tourist destination, we all know that. There are more beautiful and more interesting places where you could choose to go and, more often than not, you will not make a mistake. A lot of Romanian people do exactly the same thing: they ignore their country and go and admire a lot of other wonderful places anywhere else in this world. And theirs is not a mistake either. 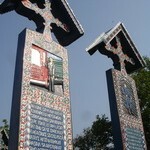 However, what the best Romanian resorts bring on the market is something you are not going to easily find elsewhere. They won’t impress you by pompous buildings, modern clubs or neat gardens but by their archetypal beauty. They are the perfect place for those of you who just want to take a break and slow time down. 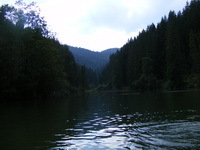 One of the beauties of Eastern Carpathians is the Red Lake, found within the Harghita county. The lake has natural origins, dating back to 1837 due a landslide over the rivers Licas, Oaia, and Rosu (Red). As there was a forest on that place before the landslide, you can still see trunks of trees coming out of the water. The surrounding landscape (a majestic coniferous forest), together with the trunks, create a dark and frightening atmosphere. So, you get on a boat and with a trembling hand start paddling and keeping a watchful eye around you so as to avoid the hidden trunks that might hit your boat. But then, you come to notice that you should also be careful not to hit the friendly ducks that stubbornly insist on racing with you. 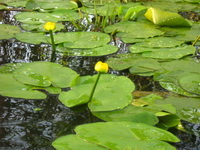 They are cute little creatures whose aim is only to make your boat ride even more pleasant. 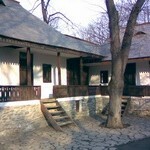 Not everyone would say that Sulina is one of the best Romanian resorts. They would agree, though, that time stands still there. 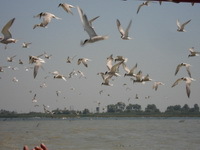 Sulina is a wonderful destination as you are close to the sea and to the Danube Delta as well. You can take long boat trips on the canals of the delta as the locals are more than happy to take you. They will tell you all they know about these places, teach you how and where to fish, help you cook the fish afterwards and generally spend a pleasant day. On such a trip, you can admire the water lilies that spread across the surface of the water as a man-made carpet and the numerous species of birds that live in the delta, such as pelicans for example. You can’t miss them! Later on during the day, you can relax on the beach a couple of hours. In the evening, you can take a stroll downtown; Sulina is quite small actually, but all the restaurants, hotels and other important places are found along the quay, so you can imagine the lovely sight you get while enjoying dinner or perhaps a glass of wine. These are not the top resorts you are, maybe, accustomed with but if you gave them a chance, you would see that, in some regards, they are so much better!